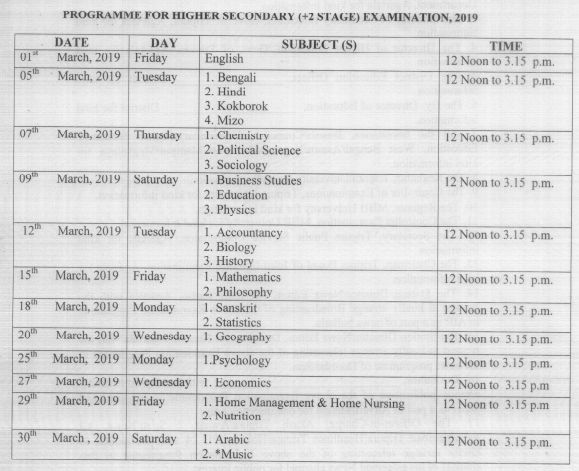 TBSE 12th Routine 2019: Tripura Board of Secondary Education (TBSE) Higher Secondary (HS) +2 Stage examinations will be held in March month for all branches, Science, Arts and commerce. Today TBSE has announced Programme for Higher Secondary (+2 Stage) Examination 2019. Students can check TBSE HS Exam Dates 2019 from official website at tbse.in. TBSE HS Routine 2019 for 1st year and 2nd year will be announced shortly by the board. Reportedly, the TBSE board is expected to announce the Higher Secondary (+2 stage) Routine 2019 in December month. Students can keep following the Tripura local news channels, newspapers on regular basis for information regarding the Tripura HS Examination dates 2019. Hence students are hereby informed to follow the news on regular basis. Check the following article to know TBSE HS/Intermediate Time Table/Exam Routine information. 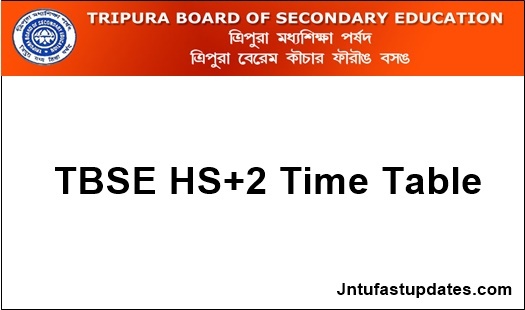 The Tripura Board of Secondary Education is shortly known as TBSE. The TBSE was formed under The Tripura Board of Secondary Education Act, 1973. Tripura BSE is the state level education board that offers the primary and secondary education for the students. Annually TBSE board conducts academic examinations in March-April months for secondary and higher secondary classes. The board monitors the education, examination, and syllabus patterns of the students. Annually a large number of students from class 10th and class 12th are coming out from this board. The TBSE is guiding the students to reach heights by providing the best education. The TBSE board has conducted the Tripura HS/12th class/Intermediate examinations between 1st March to 30th March, 2019. Tripura Date sheet 2019 was released in December and the results of HS examinations were released in May month. The board is expected to conduct the examinations approximately same in 2019. Hence students can stay tuned to check the TBSE HS exam dates, admit card release dates, result dates. Students can keep checking the TBSE website, tbse.in for latest updates. a) Duration of Examination for Music will be of 2.15 hours from 12 Noon to 2.15 p.m.
b) Practical Examinations in Physics, Chemistry, Biological Science/Biology, Geography, Home Management & Home Nursing, and Psychology & Nutrition will be held w.c.f 02-01-2019 to 31-01-2019, and the students arc directed to contact their respective schools for Practical Examination dates. Practical Examinations in Statistics will be held on 17-01-2018 at 11.00 a.m.
c) Practical Examination in Music will be held only at Agartala for all candidates between January 28th to 31st January, 2019. On the homepage, TBSE HS Exam Date Routine 2019 Link appears; Click on the Link. Its not much better for class 11th students as their exam is now at the door. Routine ki atai R change to hobe Na R???? This exm routin not beatar. 12th philosophy exm date isn’t change ?